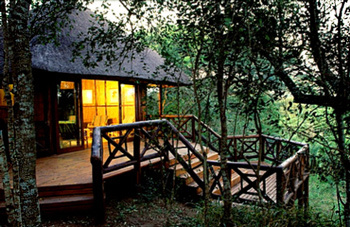 IMPORTANT NOTICE : Munyawaneni Bush Lodge is closed until future notice. Munyawaneni is located in the Hluhluwe sector of the Hluhluwe iMfolozi Park. 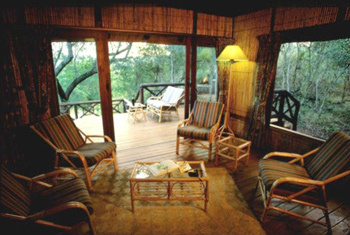 The Munyawaneni Bush Lodge overlooks the confluence of the Hluhluwe River and the Munyweneni Stream. Set in park-like surroundings, it has an outlook across a mass of reclining palms in the river bed, to a game trail that sees a large variety of animals moving back and forth between feeding areas and a safe river crossing and drinking spot. An open plan lounge and dining area adjoins four, two bed reed under thatch accommodation units, each with en-suite shower and toilet. A caretaker / cook may assist with cooking and he services the lodge. A field ranger is available and may take visitors on walks in the early mornings and late afternoons. The services of both the field ranger and cook are included in the tariff. Visitors must bring all their own food and drink. There is an open fire area and barbecue (braai) facility where guests may gather. Ideal for a dinner under the stars sitting around a fire. Munyawaneni Bush Lodge only caters for one group at a time, up to a maximum of eight guests, so for the period of your stay it becomes yours exclusively. Electrical power is from solar charged batteries for the lighting whilst the fridges and stove utilize gas. Please note that this bush lodge is not fenced and wild animals may be enter the area at any time, please be aware of this, especially after dark. We suggest that you bring torches for each of the rooms. Hyena and monkeys scavenging can be a nuisance. Please do not feed any animals.